Special thanks to all those who have family members who are serving (who have served) our country here and overseas! Your sacrifices are greatly appreciated! I used some ribbon from the newest Stamp TV kit -Eclectic Summer and some Pure Luxury rocket red and white cardstock. The star is created using the stars from Lazy Days of Summer (also from Gina K Designs). 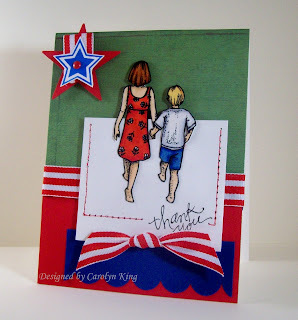 Materials used: Stamps-The Journey, Lazy Days of Summer (Gina K Designs); cardstock-red, white (Gina K Designs), blue (SU! ); Memento black ink; copic markers; rub-on (Making Memories); ribbon (Gina K Designs); paper piercing tool; red marker (SU! ); slit punch (SU!). Wishing you a happy holiday weekend!!!! Oh my goodness! What an ingenious and lovely card! I adore the way you ever so carefully trimmed out your subjects. Talk about painstaking! Have you tried the packages of party confetti like a Target in the party/gift wrap section, Party City, or Party Giant type stores. I found an American Flag pachage last year. It had red, white and blue confetti plus tiny paper American flags. Thank you Cammie for the card...you did a great job! We all need to remember those who serve with our prayers and support. What a sweet, wonderful card..Cammie!! I love it!! I love the way you added the green!! So cute!! I love how you thought the same thing I thought when I saw this set! It is a perfect card, but then again, you never make a card that isn't perfect! Hope you have a lovely holiday with family and friends. This is beautiful Cammie! I love the note from your son too! So sweet! Have a happy and safe 4th!! Your Independence Day card is just perfect, Cammie! Great card!Happy 4th of July! Happy 4th! This is a beautiful card. hope that all is well with you... has your dh deployed yet? Happy 4th to you and your family, Carolyn! Your card is fabulous...the image is wonderful coloured and I love the out of the box technique! Yummy ribbon too!! This is fabulous girlie, hope you had a wonderful 4th!! This is really cute, Cam! I hope you had a happy 4th with your family. Congrats to you, too, on all the latest publications! I just saw your work in Cardmaker the other day. Hugs, dear friend.